"Pitstone, Bucks - John Bierton measuring canister"
"Windmill at Pitstone, Bucks - canister and neck bearing showing iron spacers for lead filling"
Note on envelope reads "Windmill at Pitstone, Bucks. 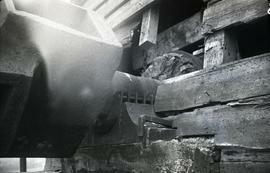 brake wheel, neck bearing and canister seen before boarding replaced on front of mill. (John Bierton looking at neck bearing) S. H. Freese, Whitsun, 1964". "Windmill at Pitstone, Bucks - canister with neck bearing showing iron spacers before being filled in with lead"
Windshaft and canister, Bradwell Windmill, Bucks"
Page n 36. Photograph taken during a trip to Holland in August - September 1953. In the same album there are more photographs of Windmill Museum in Koog aan de Zaan. 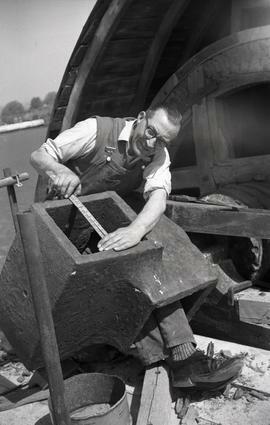 "Poll end windshaft in gardens of windmill museum, [Koog aan de Zaan]"
How to jack the windshaft to pack the neck bearing. Bob Barber is looking on.